How does Northwestern help you connect faith, emotion, intellect, purpose, mission and service? Where is your Northwestern education taking you? What direction should you take from Paul's teaching that "He [Christ] is before all things, and in him all things hold together" (Col. 1:17)? Plan to participate in Northwestern’s ninth Day of Learning in Community, which involves the entire Northwestern community in an opportunity to reexamine the calling and mission of a Christian College. Christian formation credit will be available for the 8:30 keynote and 3 p.m. panel. All workshop sessions 10:30 a.m.1:00 p.m.2:00 p.m.
10:30 a.m. Emerging Adulthood, Emerging Faith Dr. Emily Dykstra and Dr. Jennifer Feenstra, psychology | VPH 313 Who am I? What do I believe? These questions are of great importance to traditional-age college students. Psychologists have labeled the age between 18 and 25 “emerging adulthood.” During this phase young adults continue to explore their identity and determine what they believe. In this session Drs. Dykstra and Feenstra explore the particular challenges of emerging adulthood and how these relate to faith development. Given these challenges, what might a Christian college student do to remain faithful and deepen in their faith? 10:30 a.m. Get on this Train: Bruce Springsteen, the Christian Liberal Arts and Engaging Democracy Dr. Jeff VanDerWerff, political science | VPH 301 Obviously, faith is an extremely personal matter, but it should never be an entirely private one. How should followers of Jesus behave when participating in public life? How might believers develop dispositions towards justice? The role and purpose of the Christian liberal arts is, in part, an exercise in helping to form and shape such citizens. Toward that end, higher education with a mission and vision for learning like Northwestern’s should ideally equip students to maintain a faithful presence in an increasingly diverse and pluralistic society, which is required to realize the “land of hope and dreams” Bruce Springsteen sings about and the notion of human flourishing or shalom the Bible depicts. Dr. VanDerWerff's presentation draws on insights from Nicholas Wolterstorff and N.T. Wright, as well as the life and perspective of Dietrich Bonhoeffer, to frame a political theology for engaging democracy. 10:30 a.m. Seeing the World for Christ's Sake: The Role of Global Education in a Well-Rounded Christian Education Dr. John Hubers, global education, and students | VPH 205 What is the importance of experiential intercultural learning experiences in our multi-cultural/multi-religious society? Come and hear from students who have recently returned from studying overseas to learn how global education can impact your life. 10:30 a.m. The Ground on Which We Stand: Christian Education From a Presuppositional Standpoint Dr. Seunghun Hong, math, and Dr. Tyler Scott, physics | VPH 119 Any rational thought demands presuppositions, and thus, any reasonable classroom is built upon a set of presuppositions. In this session, Drs. Hong and Scott will look into some of the presuppositions encountered in the modern classroom and examine them from a Christian standpoint. 1 p.m. Diversity and the Call of Christian Higher Education: Living the Kingdom Dr. Valerie Stokes, social work, and Rahn Franklin, director of multicultural student development, with the Faith & Race Survey work group | VPH 313 When people think about diversity and higher education, many focus on counting numbers and what people look like—the enrollment numbers and the changing national demographics. What’s the motivation for diversity, equity, and inclusion? Might we instead be motivated by our faith-rooted principles and institutional mission to guide diversity efforts? How can we, as a Christian college, engage in diversity efforts as a demonstration of living the gospel? Diversity for diversity’s sake isn’t enough. Do we have a biblical call for why we engage in courageous intercultural living and learning? And if so, how can Christian liberal arts higher education answer that call? Join a roundtable-style conversation where your voice matters. Listen, engage and share thoughts. Engage in fruitful conversation about how radical inclusion is gospel-centered; explore how Christian higher education is called to engage in courageous intercultural living and learning; and dialogue about how diversity, equity and inclusion are driven by faith-rooted principles. 1 p.m. 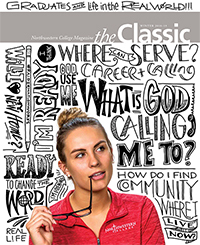 Faith, Calling and Graduate School Dr. Jennifer Feenstra, psychology, and Dr. John Vonder Breugge, religion | VPH 301 Northwestern provides a top-notch Christian education, but many careers today require graduate school in some form. What should you expect from a graduate school experience? How is Northwestern preparing you? What unique contributions can Christians bring to academia? Come and hear a panel of faculty members reflect on their graduate school experiences and learn what you can be doing, both as a Christian and as a scholar, to thrive at the next academic level. Panel members include Emily Dykstra (psychology), Elizabeth Heeg (biology), Seunghun Hong (math), Jason Lief (religion) and Chris Nonhof (education). 1 p.m. When is a University not a University? Dr. Dan Young, political science | VPH 205 Alasdair MacIntyre is one of the leading philosophers of our day; he is also a convert to Catholicism from atheism. Over the years, MacIntyre has regularly returned to theme of higher education. Dr. Young will present MacIntyre's polemic against the secular “disintegrated” or “fragmented” university: a university that has no unity of purpose. MacIntyre believes that Catholic universities are also falling into the trap of fragmentation. What about us here at Northwestern? We explicitly claim to be integrative. Are we? 2 p.m. Finding Community in Times of Fear: Bonhoeffer, Nazism and the Struggle for the Most Vulnerable Among Us Dr. Mike Kugler, history | VPH 313 Typically, we describe a liberal arts education as an opportunity to develop one’s intellectual strengths in an already vigorous academic setting. Is that primarily true also of a Christian liberal arts community? 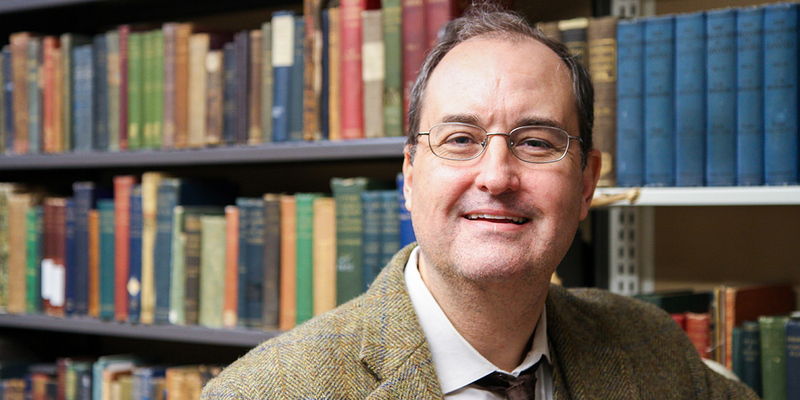 Dr. Kugler will begin by discussing some of the main claims in Dietrich Bonhoeffer’s seminal book Life Together, grounding the conversation first in the historical circumstances of his debate with National Socialism over the character of community. Then attendees will discuss who might be the most vulnerable among a Christian college community. Kugler will argue that the Christian liberal arts mission speaks of including and caring for most vulnerable, especially in an age of growing anxiety and the temptation to exclude them. 2 p.m. Home: Reflections on Scripture and Ecology Dr. Laurie Furlong, biology, and Ashley Maloney, senior | VPH 119 Gazing in awe at a beautiful sunrise or standing quietly by a rushing stream, our thoughts often turn to the Creator and sustainer of our earthly home. Many of us can recall those “mountain-top” experiences at summer camp, where we felt God’s presence and were drawn to our knees. Do you feel the same awe at home or in your dorm room? The presenters of this session propose that an ecological perspective can enhance our definition of home to encompass more than the four walls we inhabit. We are part of an ecological community of creatures, linked together by a Creator who values us all. Evidences of this community, and the Creator’s care of it, are all around us if we learn to look for it. This perspective can enrich our lives, giving us new reasons to offer thanks and new ways worship. 2 p.m. Life on a Christian Campus is Designed to Make you Weird Kendall Stanislav, assistant director of residence life | VPH 307 Student Life wants you to be weird. Northwestern's philosophy of life on campus and the student development methods used are all intended to make students a bit strange. In this session you will hear about how NWC programs are designed to create graduates who enter into the broader culture as distinct (which is a nice word for weird) people who don’t necessarily behave like everyone else. 2 p.m. The Christian Mandate to Welcome and Love our Muslim Neighbors? Dr. John Hubers, global education, and Kory McMahan, senior | VPH 301 Hear from students who have studied abroad in Oman about their experiences engaging in religious dialogue with Muslims. This session will ask: How are we called to love our neighbors, even those who hail from different cultural and religious backgrounds? In light of the refugee crisis facing us today, how are we called to act as Christians? As a school that is a part of the Council for Christian Colleges and Universities, how are we to respond to the statement the CCCU released protesting the travel ban recently put in place?